What's a Beercan? That is the affectionate name of a classic Minolta zoom lens. (it's appearance is similar to a tall beercan) This lens is quite old now. A legacy lens to be sure, that harkens to the old 35mm film camera days. But it still produces stellar images. The sharpness, the color and the continuous f4 aperture across the zoom is what made this lens a legend. And it still works with Minolta and Sony-Alpha digital bodies! But another feature of this lens that enabled me to produce this image is that you can stop down the aperture to an impressive f32! 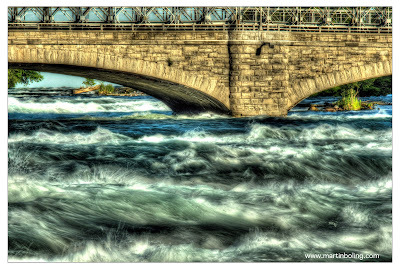 This super small aperture, together with a polarizing lens filter is how I was able to capture the unique look of the rapids themselves. Too see other Niagara Falls images, type NIAGARA in the "search my photos" box.